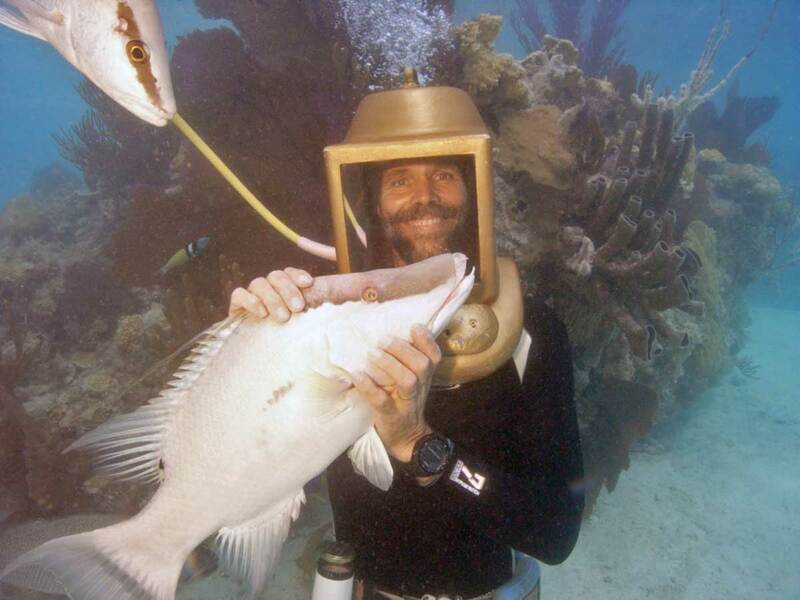 Scuba diving in Bermuda is an activity made possible by Jacques Cousteau’s invention of the regulator. It stands for: Self Contained Underwater Breathing Apparatus. There are no hoses up to the boat. Therefore, it has the advantage, and risk, of going deep and far, possibly too much so. Once training is acquired, it allows adventures undersea, with out having to lug around helmets or tanks on holiday. Because you are basically flying through the water, navigation becomes important and water current an issue. Because helmet diving plants you on the bottom, similar to the normal situation on land, current do not carry you along to parts unknown. Your hose will always lead you back to the boat, so though you could become momentarily disoriented, you can not get lost. Helmet diving could be considered less adventuresome, but definitely less risky. Our normal M.O. is walking upright and breathing through our nose. It is what we are comfortable with, and have mastered since a toddler. Having to swim, though fun if mastered, is an extra stress, for those less familiar with navigating through a fluid. Though some stress over the issue of claustrophobia, a helmet has much more room than a mask and affords a greater field of vision. Feeling trapped and out of control are issues at the heart of claustrophobia, not how big your prison is. You walk down the ladder on your own steam and come back the same way. Clearing one’s ears is also easier because there is no water tickling your ear canal. The bodies set up to create standards and protocols end up engaging in training and alteration of thinking. ‘Take only photos and leave only bubbles’ sounds innocent enough. It may be right to somewhat limit the action of those not knowledgeable in marine life. However, our end in mind is to add value to your experience by your interacting with marine life with expert guidance. If you wish to go scuba diving in Bermuda, call Chris Gauntlett at Blue Water Divers. You may also join us and bring your loved ones to experience with ease, that which you have worked to enjoy, and that which you may have hesitated to accomplish. Call me if you think this is too lame or boring.